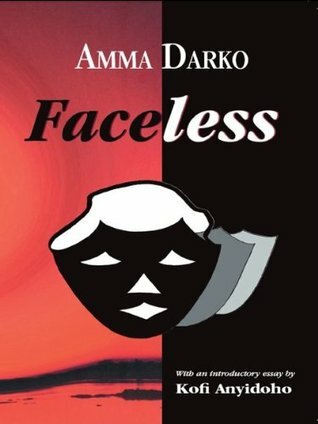 Faceless by Ghanian author Amma Darko, is one of the saddest books I’ve ever read. I discovered it via Celestine’s review at Reading Pleasure but even so I was unprepared for the bleak world it represents with such chilling authenticity. It is a story of street children in the chaotic slums of Accra (the capital of Ghana) and although it ends with a hopeful resolution for one child, the novel leaves an indelible impression that there is no future for thousands of others. It’s a story of exploitation and neglect replicated in rapidly growing cities in many developing countries from India to Mexico, made more distressing because these children have families. Part of the achievement of this book is the insight into the complexities underlying street life. Maa Tsuro is a victim of her own fecundity and the widespread belief that women are better off with a bad man than the shame of not being wanted. She is illiterate and unemployed and she falls for sweet-talking men who hint at regular income but tragically for her children these men turn out to be more than just losers taking advantage of her. Kpakpo sexually abuses Baby T. and when she turns for help to an old family friend called Onko, he rapes her. When Fofo finds out and Maa Tsuro is confronted by what’s happened, Kpakpo wangles the child into a ‘domestic help agency’ which is of course a brothel. Superstition plays a part in what happens next, but it’s poverty, ignorance, gender relations and hopelessness that underlie the tragedy of these lives. Darko doesn’t dwell on it, but even as Fofo enters rehabilitation under the auspices of MUTE there is still the unresolved question of whether she has AIDS or not. And she is just one child of many. There are light-hearted moments in the novel, especially through the motif of ‘Creamy’ – Kabria’s capricious old VW Beetle, and Fofo is a spirited and intelligent girl whose sassy chat with Odarley is funny and wise. Kabria’s rebellious thoughts about her household situation are droll and show the author’s sense of humour about the battle that lies ahead if women are to achieve anything like equality in the home or anywhere else. These contrasts lighten the mood and make reading the book a bearable experience. Faceless is Darko’s third novel and I shall be looking out for the others. I have a suggestion provoked by this book: let’s use the power of our blogs to help spread the idea that limiting Christmas gift-giving to a special few, enables a gift via Oxfam Unwrapped or any of the other NGOs or charities that support aid and development. My favourite gift is this one, and since I stopped giving those ‘obligatory’ gifts at work I’ve bought lots of them over the years, but there are plenty of others to choose from. Print copies are horribly expensive at Fishpond and similar online stores (Faceless) so although I hate supporting That Big Behemoth I bought this one for the Kindle. Sadly, the issues raised in Faceless are so endemic. I am pleased to see that two readers have clicked through to Oxfam already! I agree, these are the major themes, expressed in a story that tugs at the heartstrings. I think the tittle is very relevent in telling us more about the story. Fofo was faceless in the story but before the story ends we see some light shining to give her a face. Also some characters in the story were faceless because of their irresponsible behaviours. The men mostly in the story had no face, even the government to some extent was facelessness in the story. This story teaches us that, in order for every country to fight against any social cancer like streetism, every member of the community must play a role if not the problems at hand can’t be eradicated. Even the government alone can not eradicate these kinds of problems. “Psychological sense of the community” is very important. You are right, it is a clever title, with many layers. It also calls to the international community as well as the local one, for people in the privileged West to put a human face on global poverty and to do something about it. Well, the book faceless has very many themes. Some of the top themes are the theme of : parental irresponsibility, fear, the phenomenon of the street child, superstition etc. Fofo in this story represents hope for the street children. Even after all Fofo went through living on the streets, after nearly being raped by poison, she still lived on hoping for a brighter future without giving up for any reason whatsoever. The children in the prose faceless were oppressed, intimidated and lived in fear. The fear of poison in Sodom and Gomorrah was known as the beginning of all wisdom. Poison who noticed the gravity of their fear for him took advantage of it and became the street lord. Poison was a terror to the extent that maa broni an old woman, despite her age was afraid of him. Fofo’s parents were irresponsible and did not take a reasonable part in raising their children. Fofo’s mother allowed baby T to continue with her job as a prostitute and Fofo to live on the streets. At Fofo and baby T’s age, their parents are meant to be a source of their daily livelihood. This blog is not really of help to children who need to know more about the book. Hello, and thank you for your comment. I agree: I think the author is showing that these young people in the book are having to look out for themselves because the adults who should care for them don’t. But the adults are also damaged people who have been brought up in the same poor environment. Intergenerational poverty is the cause of much of the tragedy in this book. Please note that this blog is not intended for “children who need to know more about a book”. In my opinion, students would do best to read the book, think about it, and discuss it with their teachers and other students. Hello Audrey, this sounds like an essay question to me, and it’s one that only you can answer because it depends on how you read the book and each answer would be different. Do *you* think the author was right to call the book ‘Faceless’? Do the characters seem like faceless people to you, not literally faceless like zombies, but people with no personality or individuality who don’t matter to anybody? They don’t seem like that to me, so I think that I would answer that question by giving examples of the personalities in the book and how they matter to each other. And then I would ask myself then why then did the author name the book Faceless, and I think it’s because she wants to remind us that a lot of people treat poor people as if they are faceless and don’t matter. Hello Marvis, yes, I agree. It’s a remarkable book. what I wanted to write at the later was ;how you can be of help to help me pass once and for all.Thank you. Hello Rakia, first of all I want to say that I think it is great that you are not going to give up. You are going to try hard and sit the exam again. And that means that even if you fail again, when you look back at your life later, you will know that you did your very best. But Rakia, I am not someone who can, or should, help you. I read the book a long time ago now and I can’t remember the details well enough now to answer any questions about it. But also, I am not someone who can help you because I don’t know you and I am far away in Australia and I don’t know what your teacher might want from you. It is your teacher who should help you, or a good friend who can take the time to help you with understanding the book. Because whatever you find about the book on the internet, you will only pass the exam if you can put your own ideas into your own words. And something else: it is the start of the year now, and maybe you are reading the book at the beginning of the year and don’t really understand it. I have felt like that about books when I first read them, and my teachers helped me understand them when they were taught in class. So don’t feel too discouraged. What I would do now, if I were you, is to read each chapter, list the characters in it, and then write a short summary of what happens in that chapter. Then, when you have to think about the ideas that the author is concerned about, you can look back at your summaries to find examples. For example, if there is a question about whether a woman is better off with a bad man than having the shame of being unmarried, you can look in your summaries at what happens to Maa Tsuro, and decide for yourself which is better, for her, or for any woman. The other piece of advice I would give you is this: I can see from what you wrote that you struggle a bit with writing good grammatical English. Make time to write a diary about what you do each day, and write it in the best English that you can. I am trying to learn French, so I write my diary in the best French that I can do. It is hard at first but it really helps and it will help you when you have to write good English as fast as you can in the exam.